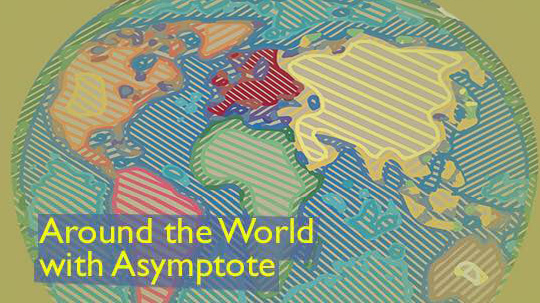 As the week comes to a close, we’ve been busy reading and re-reading the Fall 2016 issue of Asymptote, while trying to escape the fact that November is nearly upon us. This week, we hear from Alice Inggs, Editor-at-Large based in South Africa, who shares the details of the literary awards season from across the continent. We visit Editor-at-Large Marc Charron in Canada next, before heading south to catch up with Blog Editor Nina Sparling in New York City. After peaking in the polls but missing out on the Nobel Prize for Literature, Kenyan writer Ngũgĩ wa Thiong’o, author of Decolonising the Mind: The Politics of Language in African Literature and In the House of the Interpreter: A Memoir, was subsequently awarded the prestigious Pak Kyong-ni Literature Award by the South Korean Toji Cultural Foundation. Thiong’o, a champion of African literature(s), has produced novels, plays, short stories, and essays, publishing primarily in the Gikuyu language. In West Africa, Abubakar Adam Ibrahim won the Nigeria Prize for Literature for Season of Crimson Blossoms, which explores sexuality, loss, and community through an affair between a twenty-five-year-old street gang leader and a devout widow and grandmother. Shortlisted candidates included Elnathan John (Born on a Tuesday) and Asymptote-featured writer Chika Unigwe (Night Dancer). Late September through early October saw several literary events across the continent, including Kenya’s Nairobi International Book Fair and South Africa’s little known Polokwane Literary Fair. During former, which is in its nineteenth iteration, the winners of the biannual Wahome Mutahi Literary Prize were announced. Ng’ang’a Mbugua (Angels of the Wild) and John Habwe (Kovu Moyoni) won the English and Swahili categories, respectively. Renowned author Wallah Bin Wallah was awarded the Kiswahili prize. At the Polokwane Literary Festival, the first comprehensive Xitsonga dictionary (Tihlungu ta Rixaka) was launched. According to authors MM Marhanele and Vonani Bila, the dictionary was developed with the “ultimate purpose of cultural restoration, nation building, and social transformation.” Xitsonga is one of South Africa’s eleven official languages and is also spoken in Mozambique, Zimbabwe and Swaziland. Xitsonga author Moses Mtileni (previously published in Asymptote) also launched his debut novel, Mpimavayeni, during the event. The seventh annual Mail & Guardian Litfest, which took place from October 8-9 in Johannesburg, explored how storytelling in South Africa has changed over the past one hundred years. The event paid homage to South African novelist, poet, translator, and political activist Sol Plaatje. This year marks a century since Plaatje’s “Native Life in South Africa” was published. Local poet Athol Williams won the Sol Plaatje European Union Award for the second consecutive year. The 20th Poetry Africa Festival, celebrating spoken word, took place over six days, starting October 10 in Durban, South Africa featuring local and international writers and performers. Congolese-born writer and musician Wilfried N’Sondé presented his new book, “Berlinoise” during the event. Also on the program was “Vavangèr(s),” a show based on the texts and music of Réunion Island poet and musician Alain Peters. In publishing news, South African publishers Kwela Books have recently released Thomas Sankara Speaks, a collection of writings and interviews excerpting the revolutionary, prescient and often-inflammatory discourse of the former Burkino Faso leader. Sankara was a visionary who shaped national policy on anti-imperialism, pan-Africanism, Marxism and feminism. With fall slowly but surely settling in, it is, as in many other parts of the world, literary prize season in Canada. Over the next few weeks, the two most coveted prizes in English-Canadian literature will be awarded. And this year more than ever, translation and author-translators are playing a prominent role! First up are the Governor General’s Literary Awards (the country’s oldest), which reward work in both of Canada’s official languages in the categories of poetry, fiction, nonfiction, drama, and translation. In the running for the $25,000 translation prize, only three French-to-English finalists made it this year (usually the shortlist is comprised of five titles). The first is Louis Carmain’s picaresque novel Guano (originally published under the same title in 2014), translated by Rhonda Mullins, who won last year’s award in the same category for Twenty-One Cardinals [Les héritiers de la mine] by Jocelyne Saucier. The second is Geneviève Pettersen’s coming-of-age novel The Goddess of Fireflies [La déesse des mouches à feu, 2014], translated by Neil Smith, himself the author of the short story collection Bang Crunch (2007) and the novel Boo (2015), both of which have widely circulated in the English-speaking world and have been or are currently being translated into several languages. The third finalist for this year’s GG in Translation is Catherine Leroux’s The Party Wall (originally published as Le mur mitoyen in 2013, which already won the Prix France-Québec in 2014), translated by Lazer Lederhendler, a four-time finalist for the GG in Translation and winner in 2008. Like her fellow Montrealer Smith, Leroux is also a literary translator (in her case, from English to French), namely of Sean Michaels’s 2014 Scotiabank Giller Prize-winning novel Us Conductors, which also made the International DUBLIN Literary Award longlist last year. This past Tuesday, October 25, the 2016 GG for English Translation was awarded to Lazer Lederhendler for his rendition of The Party Wall. On November 7, the winner of English Canada’s most lucrative literary award, the $100,000 Scotiabank Giller Prize, will be announced. In its more than twenty-year history, the Giller has always been awarded to books originally written in English, and only a handful of times has a translation from French even made it onto the shortlist. But, as in 2015, this year is happily one of them: among the six finalists is Leroux’s The Party Wall in Lederhendler’s translation. So why would a translation win this year? Well, in the style of Justin Trudeau, I’d simply say: “Because it’s 2016!” Good luck to Catherine and Lazer! Lovers of literature were all abuzz a few weeks back when the news broke about the true identity of until-then anonymous Elena Ferrante, author of the acclaimed Neapolitan novels published in English by Europa Editions. November 1 brings the publication of two new works by the author, translated as always by Ann Goldstein (who has been featured in the pages of this journal): Frantumaglia: A Writer’s Journey and The Beach at Night. Catch “Ferrante Night Fever” events nationwide—in New York, McNally Jackson Books hosts a panel discussion with the translator herself, alongside critics and writers. Also in New York, the Festival de la Palabra brings a program of Spanish-language events in celebration and exploration of the city’s Puerto Rican heritage. Authors Andrés Neuman, Carlos Fonseca, and Yoss, all published in translation by Restless Books, also appear at bookstores, cafés, and universities across the country in discussions on their latest works. Next week, Albertine Books, the gorgeous French-language bookshop in New York, hosts its annual Festival Albertine. This year, Ta-Nehesi Coates, author of Between the World and Me, curates the lineup featuring events like “When Will France Have Its Barack Obama?” All events will be broadcast live online.